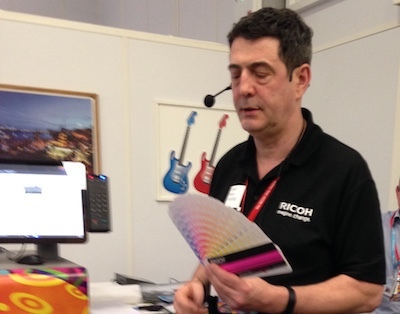 The software options for the recently introduced Ricoh Pro C7200 cut-sheet press were shown at the company's Art of the New customer event in Telford on 24 April. These include extended gamut printing using neon toners, and colour on metallised substrates. Users who want to maximise the effectiveness of the yellow or pink neon toners that the C7200 supports in its fifth colour station can use Touch7, a suite of plug-ins for Adobe Creative Cloud applications that allow the neon colours to be integrated into continuous tone images or assigned to vector art and page elements as spot colours. With the option to use the neon colours as replacements for their process equivalents or in addition to them, this allows vibrant colours outside the normal CYMK gamut to be printed by the C7200, with the neon pink enabling vivid oranges and the yellow bringing rich greens when mixed with the standard process colours. 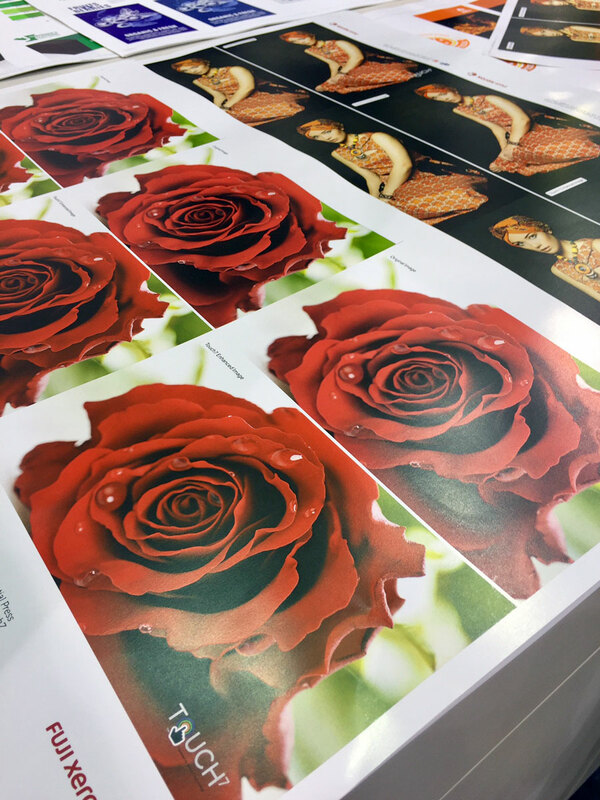 Ricoh has produced swatch books for these combinations, printed on the C7200, to enable printers to share the possibilities with their customers as an accurate guide to the colours that can be achieved with each of the neon toners. 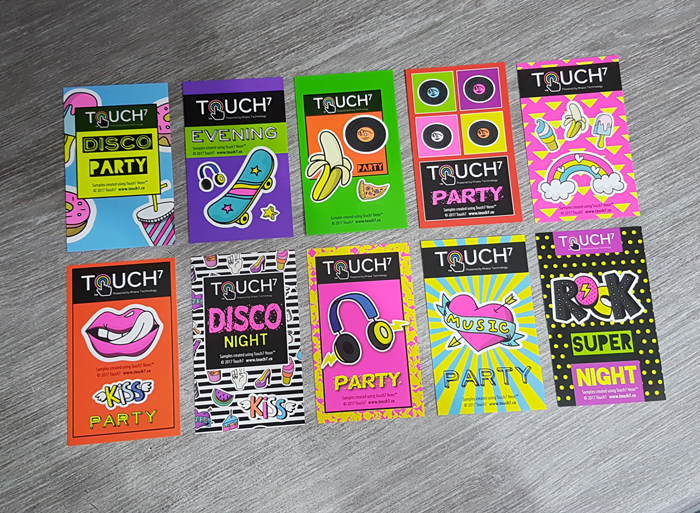 A similar pair of swatch books has been produced for use with metallised substrates, via the Color-Logic software, again showing how the neon toners can be mixed with standard process colours to achieve extended gamut print. 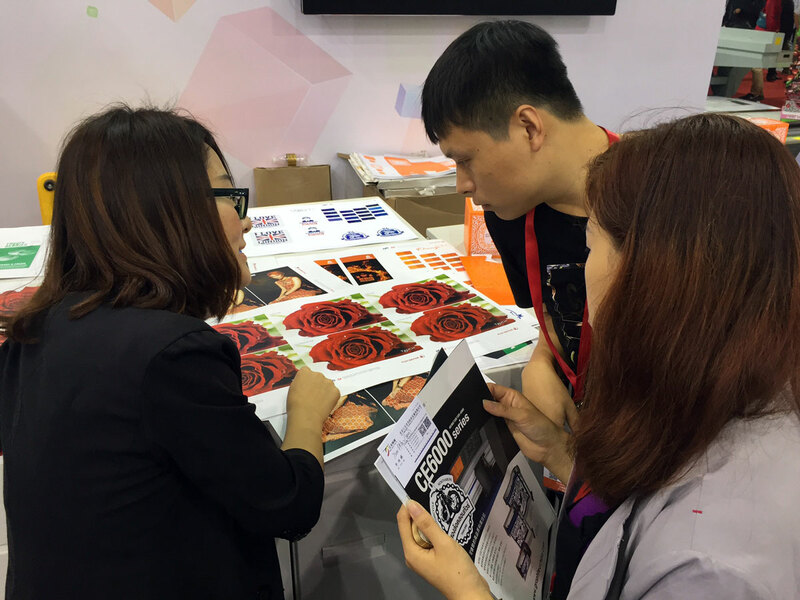 The Color-Logic software simplifies artwork creation for printing in this way, letting the user work with a "silver" spot colour thus avoiding the need to create "white ink" masks. Here's something to brighten up your day! 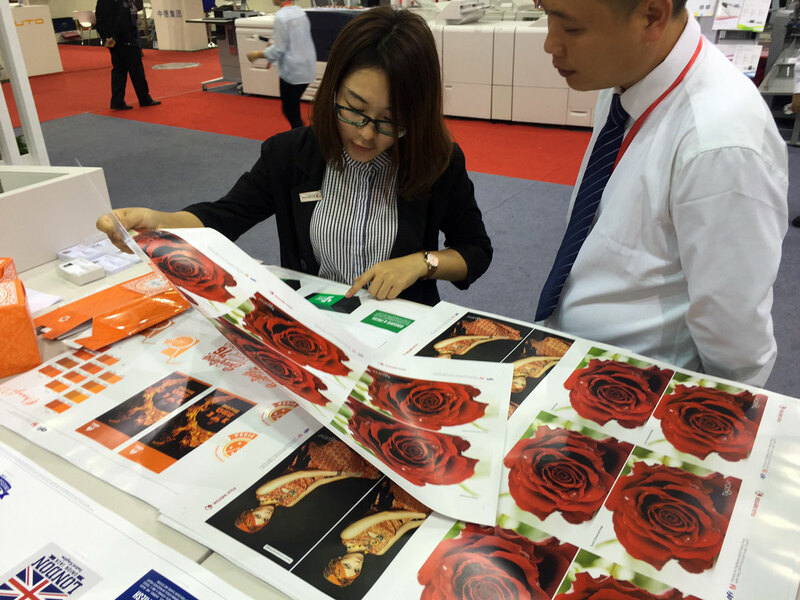 Touch7 being demonstrated at All in Print China, in the Fuji/Xerox Booth with the EFI Fiery RIP. 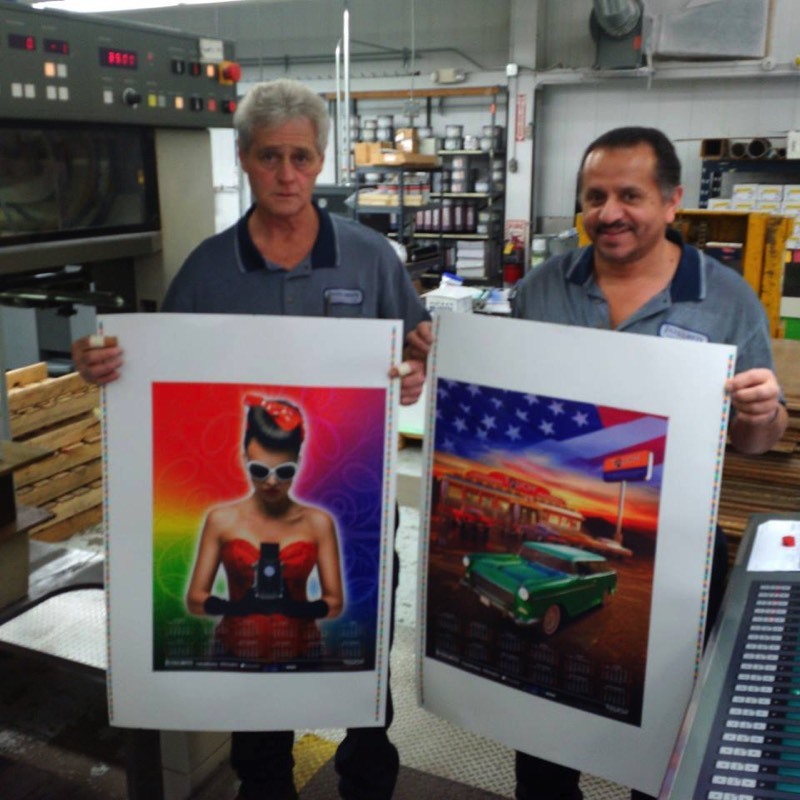 Great to see the results off the IGen 5 Digital Press with their extended color gamut ink sets! Touch7 changing what print can do one mouse click at a time. CLICK HERE to download a free 7 day trial and see for yourself what is possible with the click of a button! 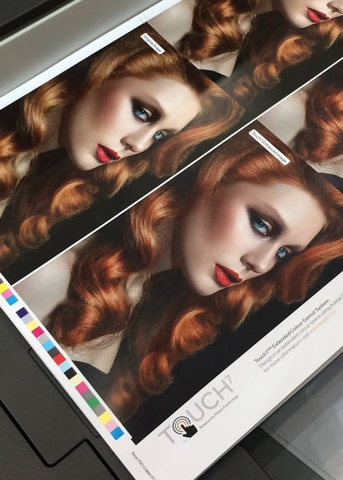 Jim Hamilton - InfoTrends, discusses Touch7 samples printed off the Ricoh Pro C5110, using only CMYK! 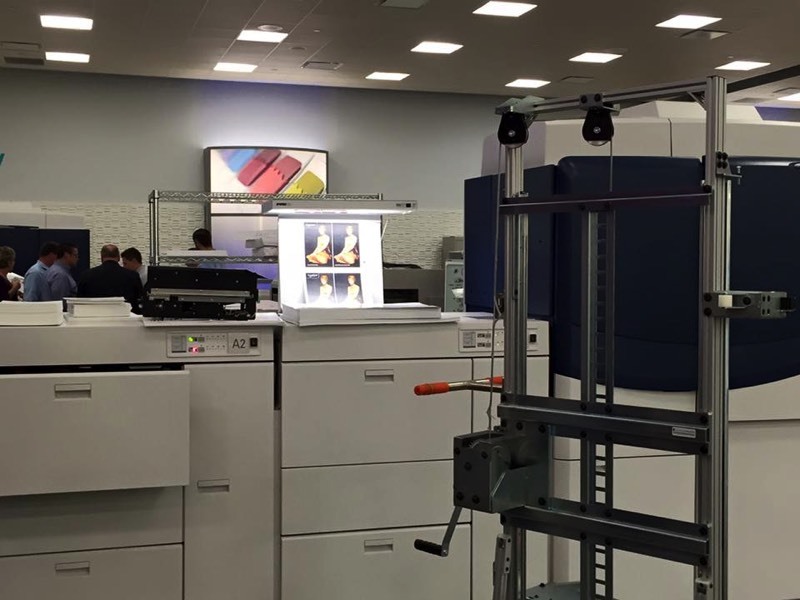 Touch7 was recently demonstrated at the Xerox Gil Hatch Centre for customer Innovation, where they printed Touch7 demo files on the iGen5 using CMYK plus Orange toner. However, what really surprised people was the ability for Touch7 files to be printed back in CMYK only, forcing the ECG spot colour to be mapped and printed to the CMYK equivalent – Due to the vastly superior gamut of CMYK toners compared to analogue inks, it’s possible to now extend your CMYK prints, without having to use an ECG ink or toner, and whilst this method of printing won’t be a perfect match to a true ECG ink, it’s impressive such a workflow can bring to your CMYK designs. Hot off the Press! Touch7 2016 Promotional Calendars printed by Integrity Graphics Inc.
As we begin another year, why not add a splash of colour to your wall, or show the power of ECG printing to your clients! West Chester, Ohio, USA; September 2018—In a ceremony immediately preceding PRINT 18 in Chicago, the Touch7 Neon Suite was designed a RED HOT Technology. More importantly, the Touch7 Neon Suite received the coveted Vanguard Breakthrough Award, presented only to products considered 'game changers.' The Touch7 Neon Suite is one of only five entries to gain the recognition, and is one of only nine recognized products in the entire Vanguard program. Commenting on the award, Richard Ainge--inventor of the Touch7 Neon Suite--observed: "In selecting Touch7, PRINT 18 management recognized the importance and timeliness of neon inks at the show. With Touch7, graphic designers can easily and confidently produce files to take advantage of the fluorescent inks just now entering the market." West Chester, OH; October 2017—Color-Logic--the exclusive distributor of Touch7 Photo--has released Touch7 Photo for Neon. Said Mark Geeves, Color-Logic Director of Sales and Marketing, making the announcement: "Touch7 Photo for Neon is plugin for Adobe Creative Cloud which enables graphic designers to add neon into images with a click of a mouse. The new plugin, like the Touch7 Photo Extended Color Gamut plugin, eliminates the need for manual masking, thereby creating in seconds what might otherwise require hours and several attempts. Both plugins were shown to rave reviews at the recent PRINT 2017 and Labelexpo 2017 shows." 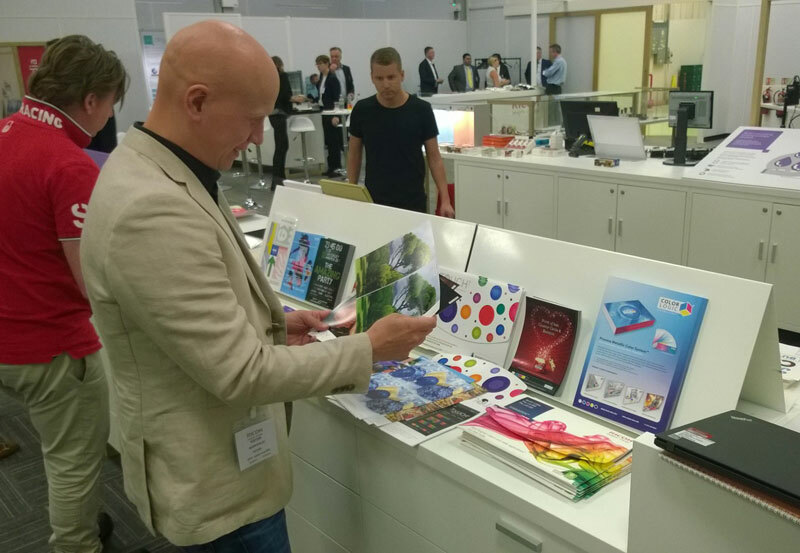 Richard Ainge, Color-Logic CTO and creator of the Touch7 technology, commented further: "Engine manufacturers continue to develop new inks for differentiating print. Touch7 Photo for Neon provides graphic designers with a simple one-button interface to create a neon separation within an image. 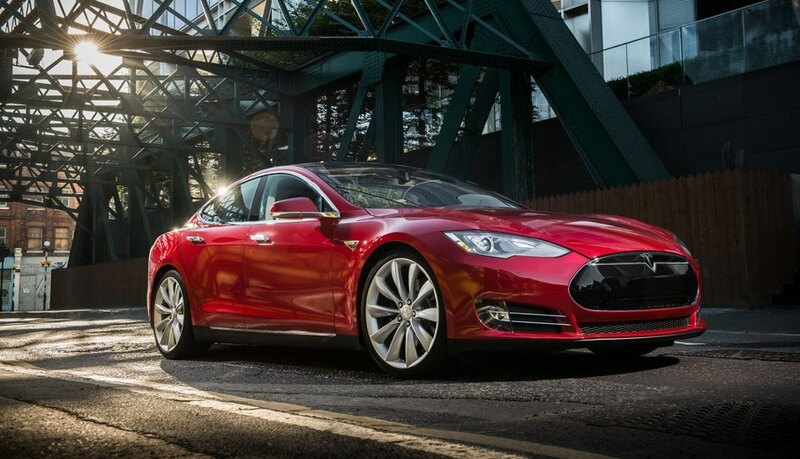 The guesswork and manual masking once required is eliminated, thus providing opportunities for generating new revenue and increasing margins while reducing waste and time-to-market with new neon ink technologies." Developed to empower photographers, printers, designers and prepress personnel; Touch7 is an extended colour gamut system for Adobe CC and is powered by Khaos Technology™, a developer of Adobe plug-ins and software tools for the printing industry. Developed to empower photographers, printers, designers and prepress personnel; Touch7 is an extended colour gamut system for Adobe CC, comprising of three primary components: Touch7 Photo, Touch7 Vector and Touch7 Soft-Proofing. Touch7™ is powered by Khaos Technology™, a developer of Adobe plug-ins and software tools for the printing industry. “The developments by ink companies, print engines, RIP manufacturers and ICC profiling tools has been extensive over the past years, however, no one has really focused on the necessity for providing creative tools for designers, so that they can utilize these developments and reduce their cycle time to production. Our focus at Touch7 was to develop an intuitive system that would help brands utilize ECG printing at a fraction of the time and cost associated with doing manual processing, and without the necessity to send your files through a dedicated colour separation system, therefore opening up ECG printing to even the smallest print shop. The true power of Touch7 lies in it’s automated ECG colour palettes and plug-ins for Adobe CC, ensuring that designers can create artworks in an extended colour gamut, without ever having to leave the familiar creative environment” states Richard Ainge, Founder of Touch7. 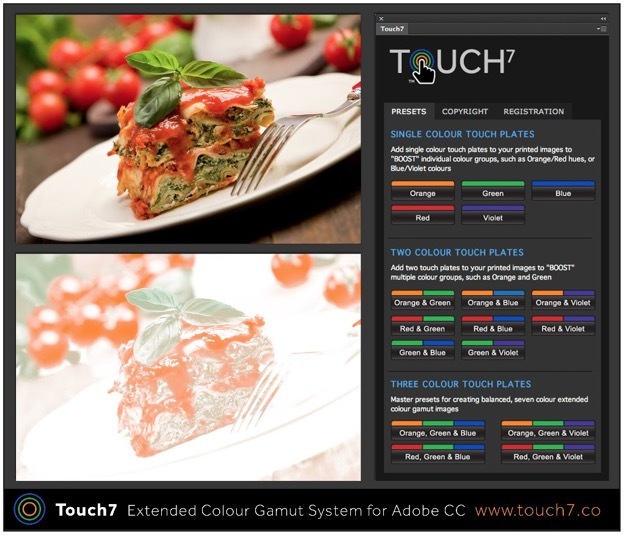 Developed to empower photographers, printers, designers and prepress personnel; Touch7 is an extended colour gamut system for Adobe CC, comprising of three primary components: Touch7 Photo, Touch7 Vector and Touch7 Soft-Proofing.